Egypt is famous across the world for its natural desert beauty and the awe inspiring monuments left behind by their ancient ancestors. Egypt is perfectly equipped to welcome tourists, regardless of local politics; the Egyptian tourism industry is highly professional and always ready to welcome holiday makers. Egypt was in fact one of the first countries to become popular as a holiday destination outside of Europe. As the country historically enjoyed favourable relations with Europe, nineteenth century travellers fell in love with the majestic Nile and the modern concept of ‘tourism’ began. Experience the unique feeling of riding one of the most iconic animals of the desert. Camels are famous for their varying characters and bumpy rides, camel riding may not be the most comfortable activities, but it’s certainly something you will never forget. The only surviving wonders of the ancient world, the Great Pyramids of Giza sit alongside the equally famous and majestic Sphinx. For many years the Great Pyramids were the tallest structures in the world and within them is a fascinating world of ancient hieroglyphs and mythological artworks. 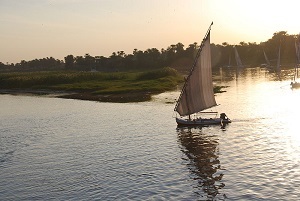 The life water of Egypt, the Nile is impossible to miss. A boat tour up stream is one of the finest ways to witness the enchanting country. A taste of modern Egypt, Cairo’s sprawling streets and bazaars are the best way to experience the culture of Egypt today. Another land of ancient mysteries, Luxor is home to the Valley of the Kings and the incredible temple of Carnac. There are more archaeological marvels being discovered around Luxor to this day, a visit to Luxor is as fascinating as it is mysteriously thrilling. To enjoy any of these brilliant activities it’s simple to book a trip to Egypt through the Away Holidays website. Away Holidays sends thousands of customers on their dream holidays every year and their dedication to hunting down the best deals means Away Holidays’ customers can go on holiday with extra cash in their pockets. This entry was posted in 5 Must Do’s in Egypt, Away Holidays, Best Holiday Package Offers, booking a holiday, dream holiday, dream holidays, Holiday, Holiday Destination, Holiday Package, Holiday Package Offers, holidaymakers, package holiday, Travel Agents and tagged 5 Must Do’s in Egypt, Away Holidays, dream holidays, Holiday on July 18, 2013 by admin.